They are driving to Liverpool. Those chocolates are nice. She is preparing for a meeting. I have done the dishes. I don’t like classical music. I have four sisters. I haven’t seen them for a while. BE: He is being rude. DO: We don’t know what to do. HAVE: I haven’t had lunch yet. can, could, will, would, must, shall, should, may, and might. We look at modal auxiliary verbs in more detail in Lesson 5.4, although we discuss will below, because we need it to help make Future Simple. + I am late. – I am (I’m) not late. ? Am I late? + He is Dutch. – He is not (isn’t) Dutch. ? Is he Dutch? + We are students. – We are not (aren’t) students. ? Are we students? + Yes, I am. we use the first person form of be in present simple. + I was late. – I was not (I wasn’t) late. ? Was I late? + He was late. – He was not (wasn’t) late. ? Was he late? + We were late. – We were not (weren’t) late. ? Were we late? 4.6.7 When pronouncing auxiliary verbs it is important to remember that since they are function words they are usually contracted in informal speech and writing. If you do not use contractions, your spoken English will sound too formal and your informal writing will too. 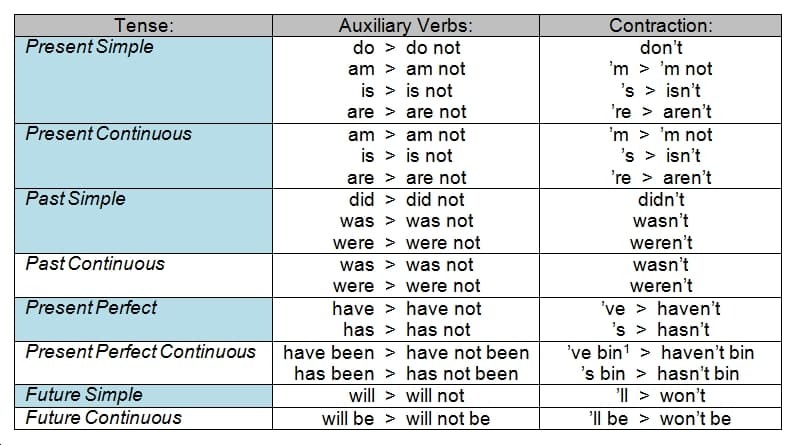 In addition – and more seriously – if you do not use any auxiliary verbs a native speaker may well understand what you mean, but your English will sound ‘broken’, for example: ‘I going to a party’, rather than ‘I’m going to a party’. Of course, we write ‘been’ not ‘bin’, but we pronounce ‘been’ in the contraction more like the word ‘bin’. In English ‘bean’ is a legume, but is pronounced the same way as the full form (individual pronunciation) of ‘been’ (they are homophones), so if you pronounce ‘been’ like ‘bean’ we may start thinking about dinnertime! 1. Who are you taking to Kam’s party on Wednesday? 1. Who do you want to win the cricket match? 1. Who have you _____________________________________________? 2. What have you _____________________________________________? 3. Why have you _____________________________________________? 4. Why haven’t you _____________________________________________? 5. When have you _____________________________________________? 6. Where have you _____________________________________________? 7. How have you _____________________________________________?